A lambda probe (or oxygen sensor) can be found on the exhaust system of most cars running on unleaded fuel. Having reached its normal operating temperature (of about 600 degrees Celsius!) 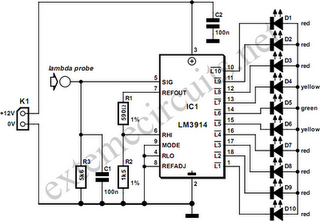 the lambda probe supplies an output voltage proportional to the amount of residual oxygen measured in the exhaust gas. This information is indicative of, among others, the air/fuel ratio supplied by the carburetor(s) and hence the combustion efficiency. In modern car (and motorcycle) engines, this information is used to (electronically) adjust engine parameters like ignition timing and fuel injection. The indicator described here is intended for permanent installation on a motorcycle of which the air/fuel ratio needed to be watched, with the obvious aim engine power tuning after ﬁtting a different set of carburetors. Apart from this obvious technical use the unit’s bright LEDs will no doubt attract the attention of curious motorcyclists. At the local junkyard a single-wire lambda probe may be salvaged from a wrecked car. Once a suitable nut has been found, the probe can screwed into the exhaust pipe of the motorcycle, at about 30 cm from the cylinders. Since we’re talking of welding and drilling in an expensive (chrome-plated) exhaust pipe, you may ﬁnd that actually ﬁtting the probe is best left to specialists! The starting point for the design of a suitable electronic indicator is that in the noble art of carburetor tuning an air/fuel ratio of 14.7 to 1 is generally considered ‘perfect’, the range covering 16.2 to 1 (‘lean’) to 11.7 to 1 (‘rich’). 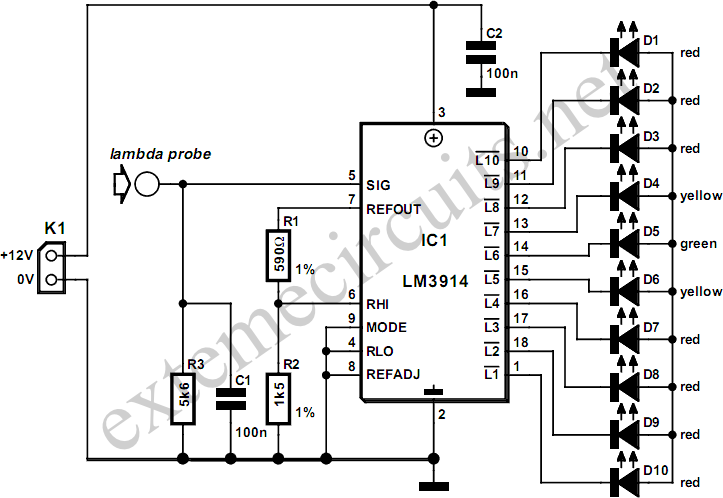 The perfect ratio typically corresponds to a probe output voltage of 0.45 V. Referring to the circuit diagram, that is the input level at which 5 of the 10 LEDs will light, including the green one, D5. If one of the red LEDs lights, the mixture is definitely too rich. Note that in general it is better to have a mixture that is a little to rich than one that’s on the lean side, hence a yellow LED lights between the green LED and the ﬁrst red one. Also note that the engine needs to be at its normal operating temperature before a meaningful indication is obtained.